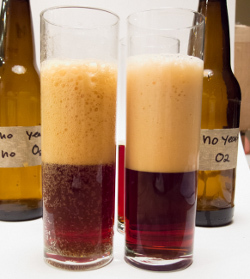 The beer on the left, the one with the coarse bubbles was bottled w/o O2 and the one on the right was. The difference in foam stability is astounding. But I have to admit that this was only one bottle against another one. It's likely that the O2 didn't cause this difference and I have to see how other bottles of this beer pour. I don't think many are playing with intentional beer oxidation, but I think brewers should. I know Fred noticed better aging through oxidation. Maybe O2 at bottling time can become a respected technique even though it flies in the face of conventional brewing wisdom. That's a great experiment Kai. I am getting ready to bottle the rest of a keg of old ale and I don't really have a way to purge the bottles with co2. given your results I won't worry about that so much. I don't have a way to purge the headspace with pure o2 either but that's okay. what you could do is remove the foam from the head space or leave a large enough head space that there is air in the bottle. Then compare a few months later. I'll give that a try. I have been filling the bottles to within about .5-.75 inches from the top and capping on foam per 'common wisdom' so when I bottle this up i'll repeat your experiment... sort of. I'll do have the bottles the 'normal' way and half your way. If I have an empty keg I can use to run co2 through I will split it three ways. tiny headspace with air, bigger headspace with air and control with co2 purged bottles. I'll see what I can do! Kai - were both glasses beer clean? The one on the right has bubbles on the glass below the surface of the beer. Good point and I did think about this. There were lots more bubbles on the glass of the non-O2 beer which could be related nucleation sites like lime scale. But I also noticed the foam instability in the other glass that I used for this beer. But making sure the glasses had the exact same cleanliness for each beers was something I did not pay attention to at the time. I will make sure of this next time I compare samples. This means soaking in diluted vinegar, cleaning with soap and rinsing with RO water. Since this is a lot more work I only do that when I want to take “pretty” pictures of beers. In general I don’t see much effect of the glass on foam stability. As mentioned in the post I regularly asses foam stability and rarely worry about special cleaning of the glasses. I wash all these glasses in the dishwasher. In the vast majority of cases the foam is pretty stable (7+ min). I know that there was no oil in or on the glass, though. Thanks, had to ask the question. I sometimes pull a glass from the cabinet that ends up looking like the one on the left, probably due to dust. The one on the left looks just like Ray Daniel's "example of a glass that's not clean" photo. In regard to Kai's comment about "better ageing with oxidation," I just did a blind triangle test with a friend and two big beers. One was a Baltic Porter (w/ lager yeast) and the other was a Belgian Dark Strong (w/ Chimay yeast); one sample of each had sat in the cellar at around 60 - 65 for six months, and the other sample had been in a fridge at 42 - 45 for that same time. I remember that there was a difference in appearance and in the bubbles, can't remember about foam stabillity, but I have no photos to share anyway. The big thing was the taste; both of us correctly differentiated and matched both brews. I found it amusing that he preferred the refrigerated samples; I greatly preferred the cellared samples. I found the cellared examples to have somewhat sherry-like or liquor like complexity that works well with a lot of darker brews. I've long suspected that I like a bit of oxidized ageing to the big brews, and have the proof now! Foam stability is somewhat to interest to me. From beer presentation point of view. I have a small BK and I had a boil over quite often. I discover that beers without boil-over had better foam stability then beers with boil-over. It goes down to soluble and non soluble proteins. So do not skim the protein from BK and do not have boil-over. Re: glass cleaning....I've been doing a salt scrub recently when I want sparkly clean glasses. Get the glass slightly damp, sprinkle salt all over the surface, rub with a paper towel and rinse. Makes a noticeable difference in beer foam. I think the primary thing you were witnessing was the accelerating effect of temperature on oxidation. It certainly can be a good thing in some cases. Not so good in others.